Named as the best coffee shop for cakes, Artisan’s Putney branch had a lot to live up to after I’d made the long journey from north London. Artisan is one of the coffee shops that takes its craft very seriously with the website proclaiming that each barista treats “each cup like a fine chef does a meal.” While I appreciate the effort, does it live up to the expectations or are too many cook spoiling the brew? A great cup of coffee using Allpress coffee. It was dark and bitter with hints of chocolate. That may have been due to the – uncalled for – dusting of chocolate on top. It was quite a small cup but a good price at just £2.40. 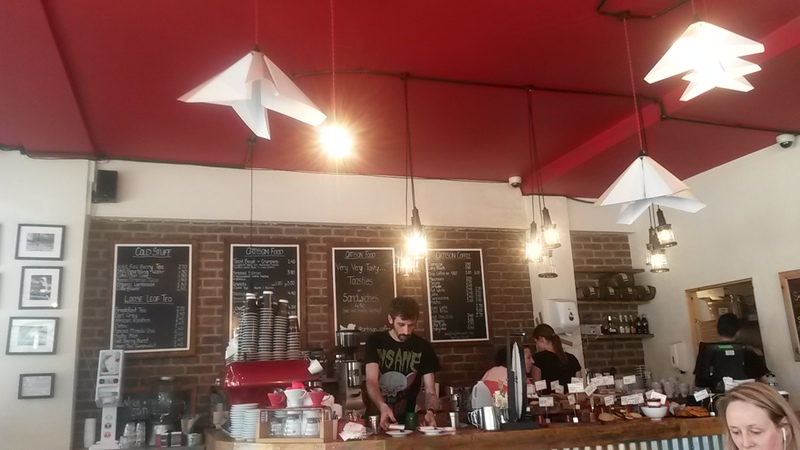 With its blood red ceiling, the open plan layout and large windows on two sides, Artisan is a funky and cool place to hang out, whilst also being bright and airy. Chalk boards give updates on what’s going in your cup and a spinning wheel gives you the chance to win a prize. Our front there are a few pavement tables – the perfect spot have a coffee with your dog or to watch your bike. The only down side is a lack of big comfy chairs. 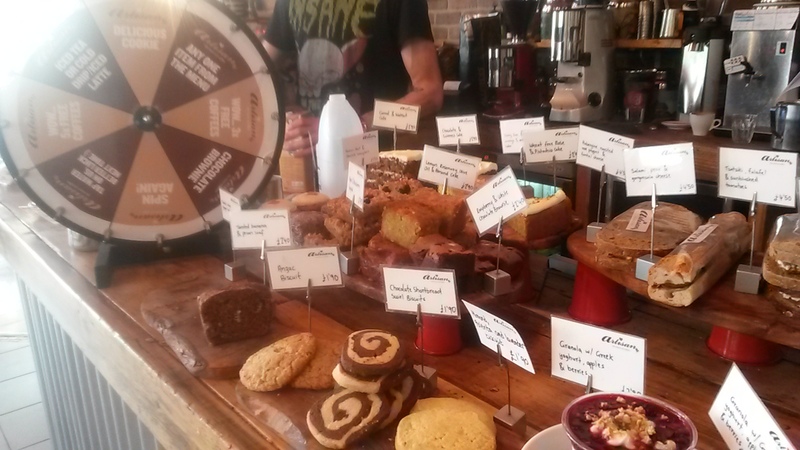 The baked good are worth their award – large and interesting selection and hugely tasty. Lunches include seasonal soups, salads and tarts. Could do with a bit more variety, but the baked goods are an excuse to spoil yourself. Friendly service by excellent staff. 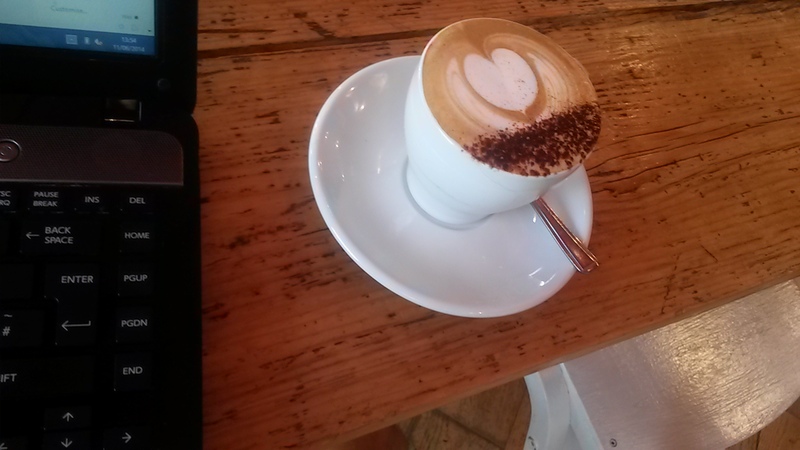 There was no faffing over the coffee – the services was efficient and timely. The art on the walls changes every three months to give local artists a chance to promote their work. There’s also the spinning wheel to win prizes and home brew master classes are available. As near to perfect as could be expected. Great coffee, great atmosphere and great eats. Coffee shops should NEVER put chocolate on without asking and they way they’ve done this looks awful; trying to be artistic and missing badly. Real Italians never put chocolate on cappuccino; if you order one in Rome or Naples they’d only offer it if they catered to tourists. I agree. It’s odd as Artisan clearly take their coffee very serious.